I spent part of this afternoon rooting around in my email correspondance from 1999 and 2000. Forgetting the wherefores and whatnots of the emails themselves, just getting into the Outlook files proved difficult. How many passwords does anyone remember from nine years ago? I actually remember a few, but not, unfortunately, the ones I needed. Sure, I found them eventually, but heavens. That's half an hour of my life I'll never get back, and it was my own fault. McCarthy was another thing entirely. What he lacked in ideology—and he was no ideologue at all—he made up for in aggression. Establishment Republicans, even conservatives, were disdainful of his tactics, but when those same conservatives saw the support he elicited from the grass-roots and the press attention he got, many of them were impressed. Taft, no slouch himself when it came to Red-baiting, decided to encourage McCarthy, secretly, sealing a Faustian bargain that would change conservatism and the Republican Party. Henceforth, conservatism would be as much about electoral slash-and-burn as it would be about a policy agenda. Just last week, new initiatives added $600 billion to lower mortgage rates, $200 billion to stimulate consumer loans and nearly $300 billion to steady Citigroup, the banking conglomerate. That pushed the potential long-term cost of the government's varied economic rescue initiatives, including direct loans and loan guarantees, to an estimated total of $8.5 trillion -- half of the entire economic output of the U.S. this year. Nor has the cash register stopped ringing. President-elect Barack Obama and congressional Democrats are expected to enact a stimulus package of $500 billion to $700 billion soon after he takes office in January. The spending already has had a dramatic effect on the federal budget deficit, which soared to a record $455 billion last year and began the 2009 fiscal year with an amazing $237-billion deficit for October alone. Analysts say next year's budget deficit could easily bust the $1-trillion barrier. The snow has begun falling in Chicago, and more is on the way. There are flurries downtown, though nothing is sticking. Matt Smith of the city's Department of Streets & Sanitation said in an e-mail that no trucks have been sent out, noting that "We have good air and ground temps and that could continue to be the case for quite some time." Snow has started to accumulate on the ground and roads in the south suburbs around the intersection of Interstate Highways 57 and 80, according to observers. The National Weather Service has issued a winter storm warning for Boone, DeKalb, Kane, Lake, Livingston, and McHenry counties and a winter weather advisory for Cook, DuPage, Grundy, Iroquois, Kankakee, Kendall and Will counties. Yesterday Parker and I walked about 8 miles altogether. Today he'll be lucky to go twice around the block. Obama plans to announce the New York senator as part of his national security team at a press conference in Chicago, [Democratic officials] said Saturday. They requested anonymity because they were not authorized to speak publicly for the transition team. In unrelated news, today is the last day of the Atlantic hurricane season. The only thing that makes sense to me: someone wants to start a war. I hope to all humanity India and Pakistan keep their senses over the next few days. So do the Indians and Pakistanis, I expect. Suddenly, we ran out of money and, to avoid collapse, we quickly pumped liquidity back into the system. But behind our financial crisis a much more ominous crisis looms: we are running out of nature… fish, forests, fresh water, minerals, soil. What are we going to do when supplies of these vital resources run low? It will take a massive mindshift. 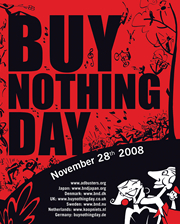 You can start the ball rolling by buying nothing on November 28th. Then celebrate Christmas differently this year, and make a New Year’s resolution to change your lifestyle in 2009. Most Daily Parker readers can skip this (long) post about software. But if you're interested in C# 3.0, LINQ, or FogBugz, read on. I use FogBugz's time tracking tool to provide tracability in my billing. If I bill a client 2.75 hours for work on a bug, I want the client to see the exact times and dates I worked on the bug along with all the other details. And because I track non-billable time as well, and I often work in coffee shops or places like the Duke of Perth, I wind up with lots of tiny time intervals that I have to aggregate to produce a bill. That's it. Share and enjoy. Calculated Risk hits the nail on the head: "[W]hat happens to U.S. interest rates if China slows their investment in dollar denominated assets?"